My Language Learning Part 1 – Lights, Camera, Action! I have mentioned in previous blog posts that ever since I came to Switzerland, I have been learning German – I love languages, and I think that being able to communicate in the language of the country you live in is great, makes your life easier, and opens new doors for reading more and understanding films, taking part in discussions and so on. Plus, it is respectful to the country and people who have welcomed us. After my very first visit to Istanbul in late 2012, I totally fell in love with the people, the country and the language so I thought about starting to learn Turkish as well. I must admit, it is one of the most difficult languages I have undertaken, but I love the sound, the poetic meanings words and expressions can take, so I am going to continue and I really want to learn! I would never have done it without the help of my good friend and teacher, Dinçer Demir, who very patiently teaches me on Skype once a week. I also try to listen to songs on YouTube, make out the words and sounds that the language has. Sometimes, it gets really hard and I think of the usual I-don’t-live-in-the-country-so-my-exposure-is-low excuse. I have decided to stop that, and get as much exposure as possible. Last Sunday, I was listening to a beautiful Turkish song a good friend, Esra Aydın, had posted on Facebook, and now YouTube has a new (at least I have just discovered it) function called AutoPlay, which immediately starts a new song of the same genre you were listening to before. 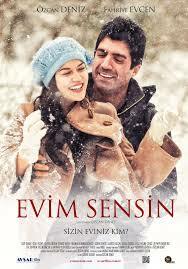 So, another song came up, a beautiful one, and I saw that is was part of the soundtrack of a film, called Evim Sensin (You Are My Home). I thought, hey great idea, why don’t I try to watch this film and see what I get from it language-wise? It is the typical girl-meets-boy storyline, so it cannot be so difficult to start with. Oh my, I had so many difficulties but I am happy I watched it for various reasons. I realised that I understand much more than I thought – even though my speaking still needs a lot of work, but that is the last stage of a language that we can reach proficiency in, I believe and I always see it in my students as well. The typical girl-meets-boy storyline proved to be even harder than I thought, because the story was so complicated and had ups and downs. Of course, the actors’ body language helps a lot, but very often I found myself wondering, what they had just said and the man was deep in thought, while the girl was still happy and smiling, or why the girl had gone to the hotel – was that her husband’s mother she was going to find there? It really helped that the movie did not have subtitles, as I was under pressure, let’s say, to comprehend on my own. I guess if I do this often, I will improve. This first time, though, was very difficult – but I learned a lot of new words, connecting them to the looks on their faces, gestures or if they were pointing at something or holding it. I learned a lot of new things about the culture, like a great singer called Sezen Aksu, who sings one of the songs in the soundtrack. She is a living legend in Turkey and it was great to get to know more about her and her work! Dinçer also does that in our lessons – he teaches me a lot about the culture as well, and I really appreciate that, as I believe culture is an integral part of language learning and I do the same with my own students, whether I am teaching them English, or Greek. I will be blogging about German and Turkish language learning throughout the year, different methods I will be trying out, the successes (I hope) and the problems I will be facing along the way. Are you learning a language? Feel free to share your experiences and ideas with me and our community of educators and students! Here is the beautiful song that led me to the film, which in turn led me to a new part of language learning! A great film by the way, produced, written, music composed for and sung by another new to me Turkish actor/singer, Özcan Deniz. Posted on February 10, 2015 February 14, 2015 by Vicky LorasPosted in adult learners, Films, Fun Learning, language, learning, life, musicTagged adult learners, Dinçer Demir, education, Esra Aydın, language, language learning, learning, life, Turkish, YouTube. I know what you mean about exposure, and you’re right: it’s all there for us, we only have to reach out and grab it! I started learning Turkish because of this: ”Bizim gozleri suyun berrak damla vardır” (Gozlerimiz -Our eyes- Nazim Hikmet). I’m so happy I did,it’s beautiful, it’s immense and, yes, difficult. Here’s a suggestion, older and a bit heavier perhaps than the girl-meets-boy scenario, but it’s one of my favourite films out there, Tunc Basaran’s ”Don’t Let Them Shoot the Kite” (“Ucurtmayi vurmasinlar”). Christina mou – çok teşekkürler! I was so happy to find out a few days ago that you too are learning Turkish – and what a great reason you started it for – Nazim Hikmet’s works are amazing. Thank you ever so much for the film recommendation – I will go and find it! Oh wow, the food – amazing! And I can’t wait for the day I can read literature in the original text. Thanks so much for your wonderful comment, Dave! Ich liebe diese blogpost Vicky dear! As you know German is a a language I’d love to learn. Not sure for what purpose though. I guess I heard once that is a language close to English but it sounds so hard to learn. The pronunciation I mean… I find it hard. Even so, I really would like to get at least an intermediate level to it. I also plan to go back in the future to Arabic. I found an interesting channel on youtube. But I’m trying to give German another go though. Have you seen Gemma Lunn’s new blogpost? As I am also learning German, I know what you mean about the difficulties…let’s both hang in there! Good luck, my dear Rose! Merhaba Vicky, and tessekurler for sharing all of this 🙂 I lived in Ankara until last September and only spent a year in Turkey, but I also love the language! Checking out the music you recommended and can’t wait to see the film. Congrats on learning Turkish! Laura wow! Awesome and I am happy you love the language too. We can share experiences!